The 7,478-square-foot gray shingle contemporary colonial at 15 Duck Pond Road sits on a level property of three quarters of an acre comprising 270 feet of direct waterfront. WESTPORT — The beauty and majesty of Saugatuck Harbor are found in its water, the sky above it and the houses that dot its coastline. Among the most beautiful, majestic, and unusual of these homes is the 7,478-square-foot gray shingle contemporary colonial at 15 Duck Pond Road. The 14-room house sits on a level property of three quarters of an acre comprising 270 feet of direct waterfront. 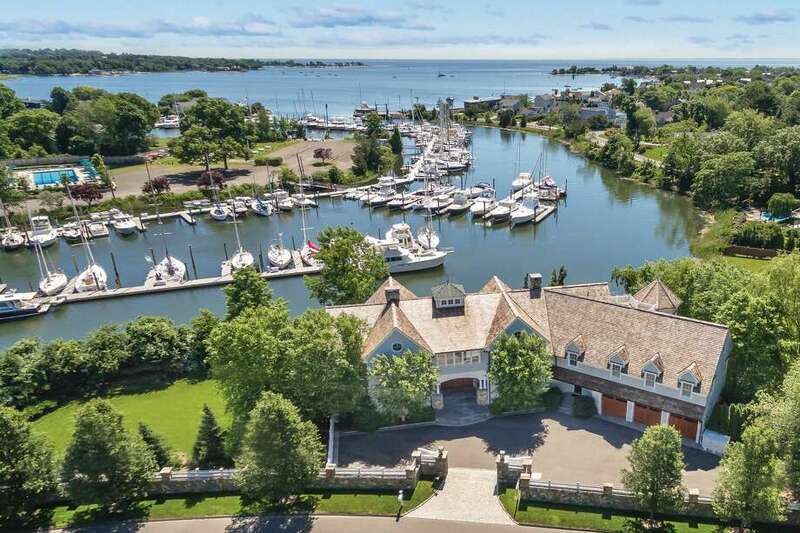 With Long Island Sound as its breathtaking backdrop this gated maritime estate offers an abundance of serenity while its location also provides convenience, especially for commuters. This property is only one mile from the Saugatuck Metro North train station and I-95, as well as local shops and restaurants. “Wake up to inspiring sunrises and end your day with brilliant sunset skies while sipping chilled wine from fabulous balconies and a rooftop deck that allows for seamless indoor/outdoor living and entertaining,” according to the listing agent’s marketing material. It’s not just the setting that provides dramatic views. Every angle and nook of this house is worth drinking in visually. Every angle, nook, and room is worthy of inclusion in an upscale home décor magazine, from the dramatic two-story foyer with its clerestory cupola to formal dining room with its custom coffered ceiling and grass cloth wallcovering. This idyllic weekend retreat or year-round residence was built in 2005 and sits behind a stone wall topped with white picket fencing. Tall stone pillars topped in contemporary lanterns mark the driveway entrance, which offers more parking for guests than is generally available on waterfront properties. Inside, it has thoughtfully planned and designed common spaces - although there is nothing common about them, and intimate spaces. The recently re-imagined interior features Brazilian teak floors, high ceilings, custom finishes, and ship-inspired design elements, the latter of which is never more obvious than in the side-by-side double, innovative, commercial-grade, state-of-the-art gourmet kitchens. The design echoes the interior of a boat and features a mahogany barrel and coffered ceiling, stainless counters, walk-in pantry, and double Gaggenau stainless appliances including glass-front refrigerators, tall wine refrigerators, and a five-burner cooktop. There is also a built-in Miele coffee maker, wet bar, and a hexagonal breakfast room. Off the kitchens there are two sitting rooms, one more sophisticated with a large fireplace, and the other a more casual lounge with a door to a wood deck. From the moment one opens the front door it is apparent that harbor views are enhanced from the many walls of windows and the doors that access the water side of the house as well as balconies and decks. In the cavernous, luxurious, multi-room master bedroom suite there is a door to a private balcony looking over Saugatuck Harbor Yacht Club as well as a staircase to a rooftop deck. That deck is the perfect place to view Westport’s and Norwalk’s Fourth of July fireworks. Enhancing the entertainment value of this house is the large, walk-in wet bar room with granite counters, refrigerator drawers, an ice-maker, and glass shelving. Adjacent to the bar is a sizable powder room with a pebble floor and vessel sink. Were it not for the beautiful water views the statement gas fireplace would be the focal point of the spacious formal living room, which also features wood paneled walls, built-in bookshelves, a tray ceiling with exposed beams, and a door to a stone patio. The first floor office features a striking striped wood floor of Brazilian teak and a second lighter colored wood. The mudroom has a built-in seating area and a full bath freshen up after boating or swimming, and it provides access to the climate-controlled three-car garage. On the second floor there are five bedrooms. In the master suite there is a sitting room, a hexagonal exercise room with a rubberized floor, two walk-in closets, and a luxurious marble spa bath with two vanities, a large soaking tub, sauna with a porthole-inspired window, walk-in shower, and a water closet with a bidet. This house also features a spacious flexible use room with a fireplace and built-in shelving, currently used as a playroom. For more information or to set up an appointment to see the house contact Michelle Genovesi of Michelle & Company/William Raveis Real Estate at 203-227-4343 or Michelle.Genovesi@Raveis.com.